Blue Springs are one of the obstacles that the Mini Marios face during the events of the Nintendo DS game Mario vs. Donkey Kong 2: March of the Minis. These objects first appeared in Tropical Island Room 2-1, and so on in later levels of the game. Their appearance is simply a blue-colored spring which has a rounded top on it. When a Mini Mario uses them, the player has to draw the stylus up near to the spring. 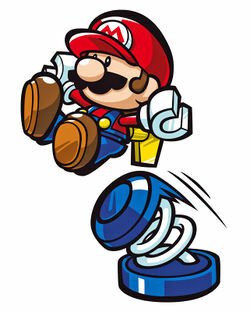 When the toy jumps on the spring, the Mini Mario will jump high and also accelerate forward depending on the direction the toy is about to make. Using them is a good way to get onto ledges. These objects cannot be moved, but are also not fixed onto the floor. A similar object introduced in the game is a Yellow Spring. This page was last edited on March 8, 2018, at 15:19.